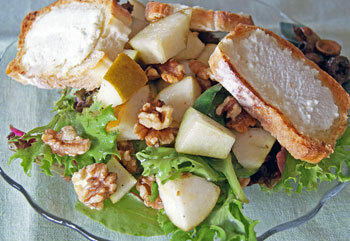 This pear and walnut salad has a wonderful tangy vinaigrette dressing made from lime juice and raspberry vinegar. Pears are such a wonderful versatile fruit that lend themselves to salads, desserts and cakes to name a few. On their own they have a delicate taste so are usually paired with stronger flavors. In this instance the lime and raspberry from the vinaigrette add just enough sweetness and zing. With the accompanying ricotta cheese croutons, this salad would make a lovely luncheon meal. Preheat the oven to 180°C / 350°F. Cut the baguette into 16 thin slices. Brush each slice with a little oil. Then, using the cut side of the garlic, rub each slice with the garlic. Arrange on a baking tray and bake for 10 minutes, or until crisp and golden. 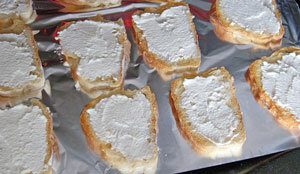 Spread some ricotta cheese on each bread slice, and cook under a hot grill (broiler) for about 2 – 3 minutes. These will cook quickly, so watch them closely or you will have burnt offerings instead. Toast the walnuts then set aside to cool. 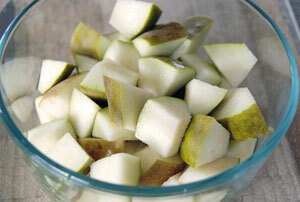 Meanwhile, cut the pears in half, remove the core and chop into 1 inch cubes. Pour 2 tablespoons of lime juice over the pears and give them a good stir. This prevents them going brown. To assemble the salad, place the salad leaves, pears and walnuts in a bowl, sprinkle over the vinaigrette and toss through. Any salad leaves will work for this recipe. I simply used a bag of pre-packaged mixed salad leaves. Combine the lime juice, oil, vinegar and black pepper in a small screw-top jar. Shake vigorously until the ingredients are well mixed. To serve, divide the salad among four serving plates, then top with the cheese croutons. Raspberry vinegar is available from delicatessens and specialty food shops. 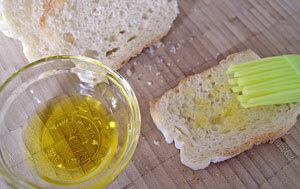 It really is worthwhile keeping a bottle in your pantry, as it adds a wonderful flavor to dressings and vinaigrettes.